In my time covering professional mixed martial arts, I have finally made my way to Madison Square Garden for the official weigh-ins for Glory 43 New York City. The venue is packed with fighters and team members. At 1:30 p.m. EST, most of the seats in the lobby are already full. Glory executives are center stage announcing upcoming events, including Vice-Chairman Scott Rudmann who announced that Glory Kickboxing will have its first card in Guangzhou, China this October. The Glory banners are all over. I’m also, clearly, the only person stupid enough to wear a paisley suit coat in 90 degree temperatures, but I digress. My seat was taken when I got up to speak to Eric Jackman by Benjamin Adegbuyi, but I’ll be damned if I’m going to ask for it back. These fighters are big and I…. am….not. Pavel Zhuravlev takes his seat before going on stage for the weigh-in. Zhuravlev is a monster. He’s also wearing a shirt of himself, normally, a Cardinal sin. And he has a qausi-manbun. If one person can get away with that look, I assure you, it’s him. Todd Grisham announced that the fights can be viewed on ESPN2 at 11:00 p.m. ET. 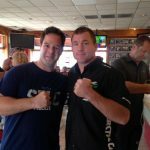 Right before the weigh-ins Tim Hughes took a well-played shot at the Mayweather-McGregor Tour stating that there is a lot of talking going on, but Glory is all about fighting. The fighters start to take to the scale for official weigh-ins. We learned earlier that Kevin Vannostrand will not be fighting Matt Embree, but rather Mo Abdurahman. Abdurahman takes this fight on three-days notice. Both fighters weighed in under 143 pounds. The winner of that fight will face the winner of Giga Chikadze and Aleksei Ulianov in the featherweight tournament. Glory 43 SuperFight Series streams live and exclusively on UFC Fight Pass at 7:30 p.m. ET on Friday, July 14.